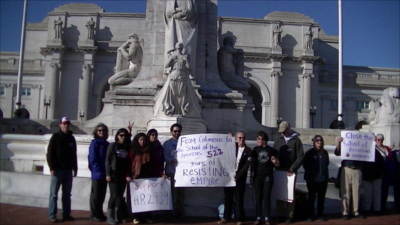 On the 31st of March, School of the Americas Watch showed up at the Columbus Monument in front of Union Station. 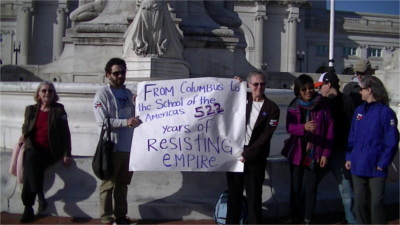 They were there to condemn the ongoing legacy of colonialism, disposession, and murder of Indigenous people started by Columbus and continued today by graduates of the infamous "School of Coups" at Ft Benning, Ga.
After the Columbus Monument appearance, SOA Watch activists boarded Metro to Takoma Park, MD for an educational event in a park. One speaker talked about what is happening in Venezuala, where another US sponsored coup attempt may be in the workd. Rev Hagler gave they keynote speech, connecting colonialism abroad with DC's own status as a colony.